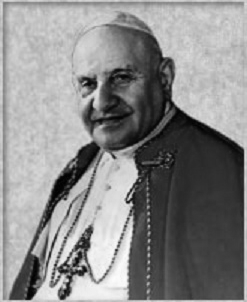 Just three months after his election as pope, John XXIII announced his intention to call an ecumenical council for the renewing or "updating" of the Church. This, the Second Vatican Council, was held in four sessions during the years 1962 through 1965. According to the Dictionary of the Ecumenical Movement, the issues discussed and debated by the Council included "divine revelation, the church, the liturgy, bishops' pastoral office, the ministry and life of priests, priestly formation, the laity, Christian education, religious life, Eastern Catholic churches, the church in the modern world, missionary activity, ecumenism, non-christian religions, religious freedom, and the communciations media" (p. 1189). In 1963, Pope John died, so according to canon law, the Council was suspended. 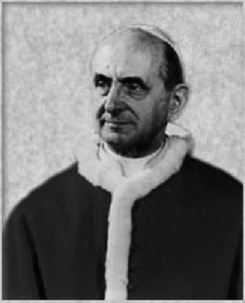 But Paul VI, John's successor, announced that the Council should continue. The results of the Vatican II deliberations were 16 documents, the ideas from which have effected every aspect of faith and practice in the Roman Catholic Church. Again, according to the Dictionary of the Ecumenical Movement, "Without taking account of the debates and resolutions of Vatican II, it is impossible to understand the modern Roman Catholic Church" (p. 1189). To connect users to resources on Vatican II in the Catholic Portal and at CRRA institutions as well as to news resources in the Catholic News Archive. To act as a bibliography to important primary source and reference materials on the Second Vatican Council, some (or all) of which may be available at a user's local library, particularly if it supports Catholic Studies. In the case of these materials, users can do title searches in their local catalogs to see if their local libraries own these books. If not, these items can probably be obtained through interlibrary loan. The immediate products of the Second Vatican Council were a series of 16 very important constitutions, declarations, and decrees. To see the documents in the original Latin and in many other languages, click here. Stransky, Tom. "Vatican II (1962-1965)." Dictionary of the Ecumenical Movement, 2nd ed. Ed.Nicholas Lossky, Jose Migues Bonino, John Pobee, Tom F. Stransky, Geoffrey Wainwright and Pauline Webb. Geneva: WCC Publications, 2002. 1188-1189. Print. "Vatican Council II." OSV's Encyclopedia of Catholic History, Revised edition. Ed. Matthew Bunson. Huntington, IN: Our Sunday Visitor Publishing Division, 2004.942-945. Print.